The film could be used for a host of applications, with faster bone healing at the head of the list. “Of all the projects I’ve worked on, I think this one has the great potential for commercialization.” Yates said. The mineral component of our teeth and bones is a material called hydroxyapatite, and it may be synthesized in the laboratory using a variety of techniques. It was known that when hydroxyapatite is heated to 300 degrees centigrade or more, ions can start moving around inside the hydroxyapatite crystals, Yates noted. 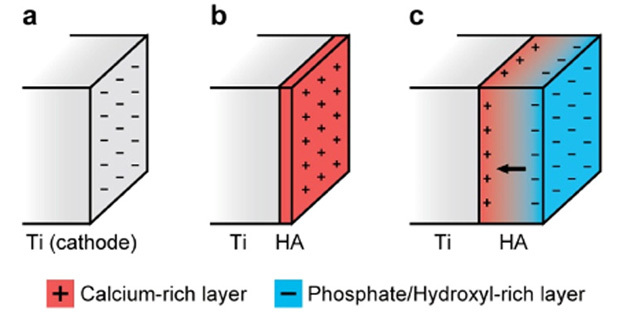 Starting seven years ago with a quest to improve fuel cell membranes, Yates and his team began investigating the ion movement in hydroxyapatite and engineering thin films of hydroxyapatite with improved ion transport. One of the techniques the research team used to make thin films is an electrochemical synthesis. During the electrochemical synthesis, two electrodes are placed in a special salt solution and the application of electrical current causes a thin film of hydroxyapatite to grow on the surface of one of the electrodes. Yates and his team discovered unexpectedly that the resultant film retained a stored electrical charge, with one side of the film being positively charged, and the other negative. The magnitude of the stored charge is far larger than any previously reported for hydroxyapatite or any other material. As it turns out, the film may not be of use in fuel cells, but it could lead to new applications in ion exchange separations, energy storage and even water filtration. However, Yates is most excited about the possible medical applications of the film -- something the team did not envision when it began the project. When the film is immersed in simulated body fluid, for example, calcium phosphate is attracted to the negatively charged outer surface, and crystallizes on it. Stem cells (that may potentially become bone cells) were also found to grow better on the negatively charged surface. This could speed bone healing, for example, by applying the film to titanium surgical screws used in rebuilding fractured bones, Yates said. His team has demonstrated that screws can be coated in a process that takes only 75 seconds. Laboratory trials using the coated screws in rabbits will begin later this month, in collaboration with Luiz Meirelles, Assistant Professor of Dentistry. This part of the project is being supported with a $100,000 award from the University’s Technology Development Fund. Yates marvels at how an initial interest in fuel cells led to a film whose characteristics ended up being especially attractive for biomedical applications. Because the film is extremely thin, for example, it is more adherent than previous hydroxyapatite coatings used in dental implants. Those previous coatings were applied with plasma spraying, which created thicker layers that cracked easily and fell off, Yates said. The highly charged surface of the film attracts water -- which would otherwise bead up on the surface of a titanium implant – and spreads it evenly. That’s a plus in attracting body fluids to the surface. And it was purely by chance – not design – that the negative charged ended up on the outer surface. “A lot of things have fallen into place for us,” Yates said. The study, published by Chemistry of Materials, can be viewed here. Coauthors include PhD students Cong Fu and Keith Savino, masters student Boao Song, and Take Five scholar Paul Gabrys, all of Chemical Engineering; Prof.Yongli Gao and PhD student Chenggong Wang of the Department of Physics and Astronomy, and Prof. Hani Awad and graduate student Diana Olvera of the Department of Biomedical Engineering.